More color options. A matted Black and a new "Jet Black" with a glossy finish have been added to this release. Dust and Water Resistant. The body of the iPhone 7 has been reengineered to hold up to splashes and brief submersion in water. No physical Home button. It has been replaced by a pressure sensitive button that's connected to a redesigned Taptic Engine to mimic traditional button presses. Brighter display. A new display that is 25 percent brighter and supports wide color gamut for richer, true-to-life colors. Faster Processor. The new A10 Fusion processor is 40 percent faster and includes two high-performance cores for system intensive tasks and two high-efficiency cores that operate at 1/5 the power to save battery life for smaller tasks. Battery life. Two additional hours of battery life are accounted for compared to the iPhone 6s, and a one additional hour from the iPhone 6 Plus. No headphone jack. The new phone is working towards a fully wireless system, requiring Bluetooth connectivity or a Lightning connector. Apple is shipping the iPhone with Lightning EarPods and a 3.5mm to Lightning adapter, plus it has designed new completely wireless high-tech AirPods to ease the transition. Stereo speakers. You’ll find newly added speakers located at the top and bottom of the iPhone. Camera system. The overhauled camera features a 28mm 12-megapixel camera with optical image stabilization, a wider f/1.8 aperture 6-element lens, wide color capture, and a new Apple image signaling processor, all of which result in brighter, sharper, more detailed photos, even in low-light conditions. The iPhone 7 Plus also has a second 56mm telephoto lens for dual-camera functionality that enables better optical zoom. In a future update, it will also support a new shallow-depth-of-field portrait mode that uses the two lenses to draw out the portrait subject while blurring the background. Brighter Flash. Four-LED flash that's 50% brighter and stronger. Facetime Camera. An upgraded 7-megapixel FaceTime HD camera with new sensor technology and auto image stabilization. Storage. The new minimum is 32GB, with 128GB and 256GB of storage also available. Price. The iPhone 7 starts at $649 and pricing on the iPhone 7 Plus starts at $769. LTE performance. 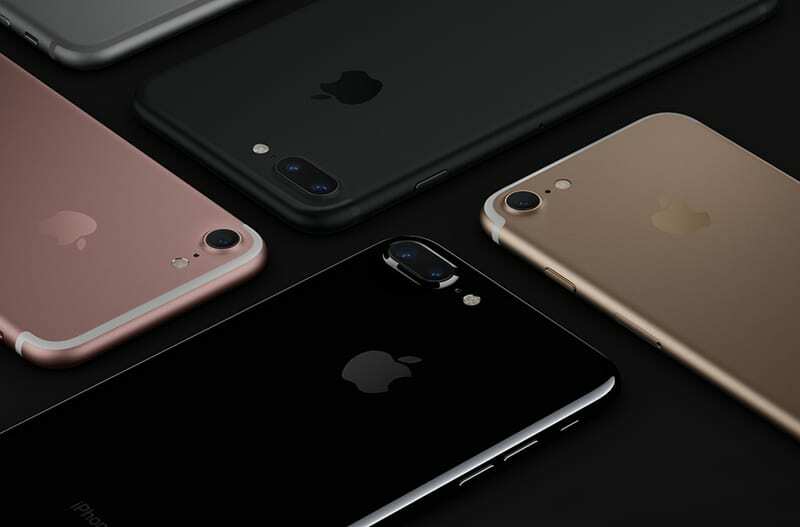 The iPhone 7 and 7 Plus use different LTE modems, sourced from Intel and Qualcomm. The Intel modem only supports GSM and is limited to the AT&T and T-Mobile networks in the U.S., while the Qualcomm modem supports GSM/CDMA and is available for Verizon and Sprint. Hissing. Some users have complained about a “hissing” or “crackling” noise that can be heard when the iPhone is under a heavy processing load. Many believe the noise is "coil noise," the sound a high powered processor makes when it is under heavy load or not properly dampened. Connectivity. Verizon subscribers with an iPhone 7 or 7 Plus have been experiencing connectivity issues, causing the iPhone to lose its LTE connection. Apple fixed the problem with an iOS 10.0.3 update. Some car owners, especially those with BMWs are having Bluetooth connectivity issues that causes the iPhone not to connect or causes audio to cut out. Activation Lock. Some iPhone 7 and 7 Plus users are running into an Activation Lock issue that causes their new devices to be locked to another Apple ID account. Apple has been able to help affected users by removing the Activation Lock on their iPhones after being provided with proof of purchase. We’ll let you decide whether the iPhone 7 and 7 Plus is worth the upgrade, but in the meantime, we hope this gave you some valuable insight when weighing your options.